Despite my obvious indulgence in luxuriously specified land yachts, I’m equally excited by small, light cars too. Their cheeky stance, pocket-sized dimensions and TARDISesque packaging are often combined with an inherent hilarity as a driving tool. A doddle around town yet refined enough to mix it in the cut and thrust of the motorway commute, there’s much to love. Yet one city car candidate never really appealed as much as others in the genre – Peugeot’s 107. 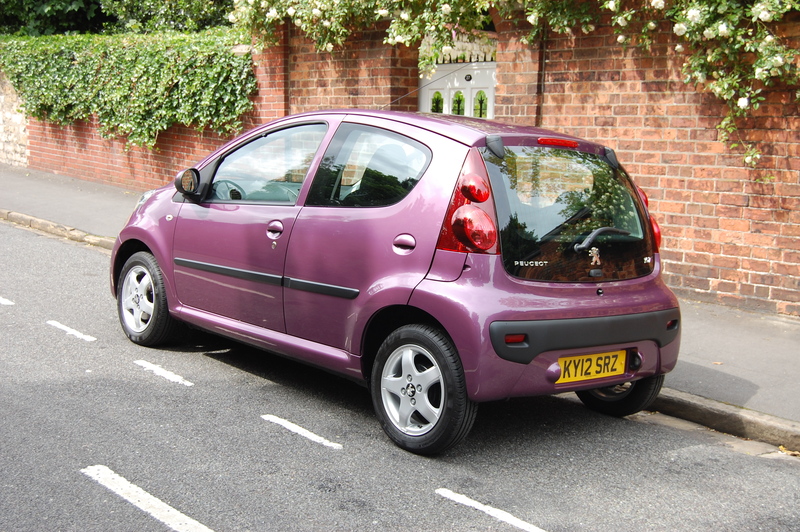 The styling was simple, but sharing so much metalwork with its Citroën C1 twin meant it was down to the noses; the C1’s just suited the package better. 2009 saw a brash reworking of the nose, with an even greater protrusion of bumperage out front, with a bright flash of chrome brace across the even gurnier grin. I was still cold. Unusually for a Peugeot, 2012 saw the arrival of a second facelift for the 107. The new snout was slimmer and daintier, looking immediately more at home on the small body. 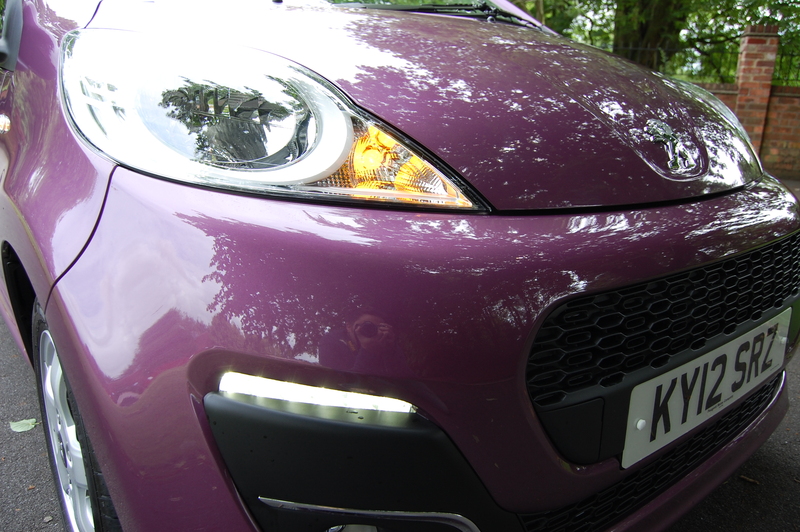 The grille had shrunk too, now flanked by fashionable LED DRLs on the high end Allure specification models. There’s a rightness about the 107’s looks now but can it be enough to hold off an onslaught of competition in the city car sector? The 107’s nose is different, but is the small Peugeot that different elsewhere? Exterior styling remains pretty much as before for the 107 as detail changes trick the eyes into believing more has changed than reality confirms. Besides the new bumper and tweaked headlights, the bonnet is fresh with a scalloped central groove for the Peugeot lion to reside in, replacing the previous Chaplin-moustache upper grille. A subtle move of the front registration plate to the middle of the grille also reduces the visual bulk. Elsewhere, new wheel trims and alloys, revised tailgate badging, a deeper shade of red for the tail light surrounds and some vibrant new colours like this shade of metallic plum make it look contemporary. Inexpensive yet effective changes but they can’t disguise the 107’s age. What about the 107’s interior? Has Peugeot livened that up? Sadly not. 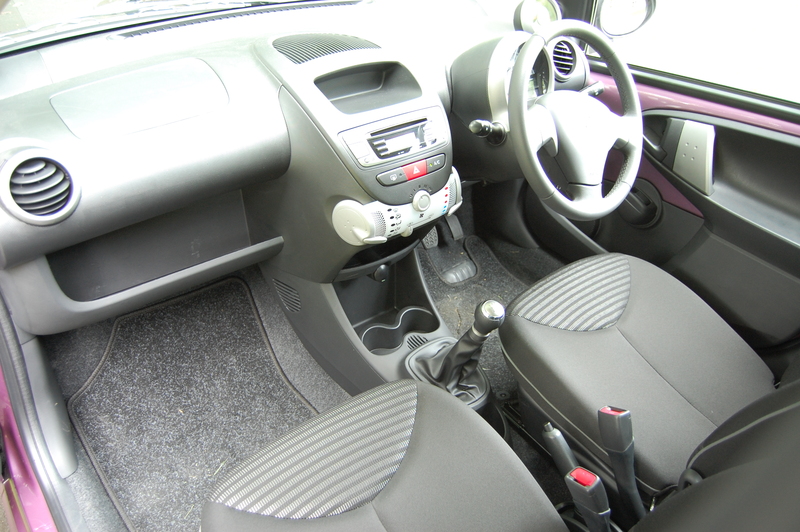 The 107 (and its C1 and Toyota AYGO brethren) still share the same interior mouldings and they still look pretty much the same as they did back in 2005. What might have looked no frills funky then is starting to look a little dated and even feel a little cheap compared to newer rivals. 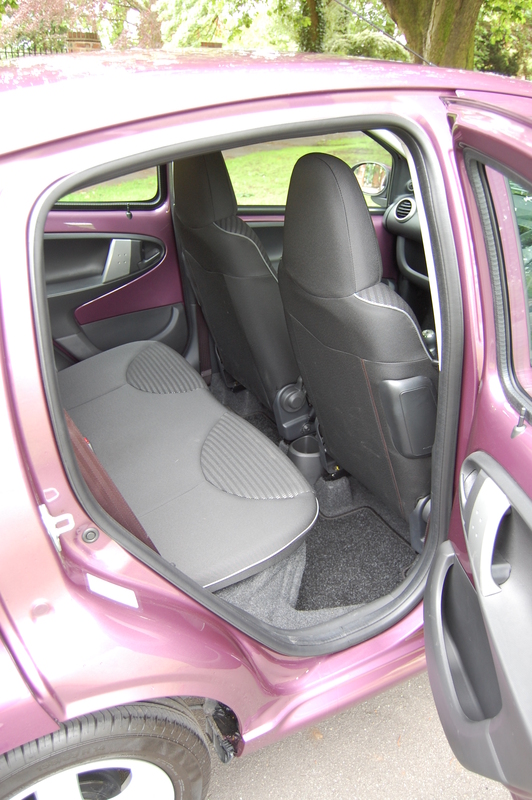 Sit in a Volkswagen up! for instance and you’d be forgiven for thinking there was at least a 50% price difference between the two. The plastics feel hard and unyielding to touch, offering little joy through either their tactility or functionality. In some instances they’re awkwardly sited too, most obvious being the door pulls which are positioned too far rearwards for comfort, the 107’s narrow cabin ensuring that a double jointed right arm is required in order to return it to the steering wheel. Slender front seatbacks ensure the rear seat is spacious enough for a pair of six footers but the back bench is flat and lacks decent support, not endearing it to its passengers. The front pair are better though but even after an hour at the wheel you find yourself jiffling to remain comfortable. 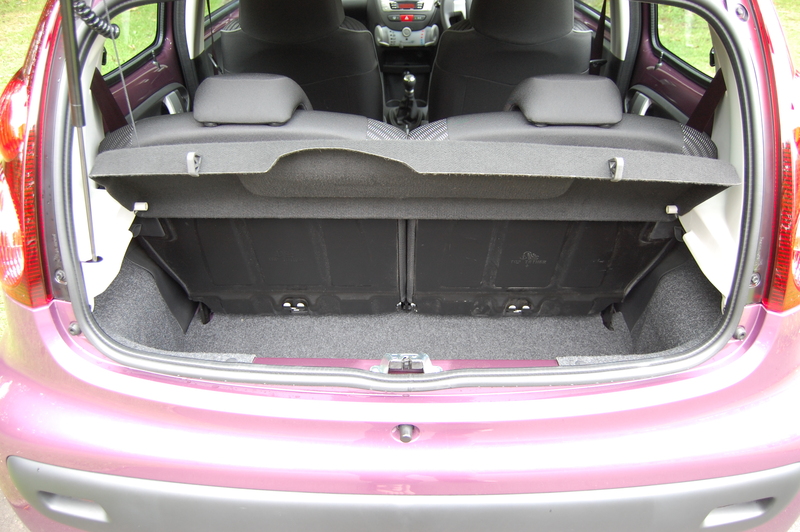 Peugeot’s 107 is spacious enough for two adults in the back but they won’t relish spending too long back there. In top flight Allure specification, the 107 is reasonably well equipped, with Bluetooth connectivity for the stereo, air conditioning, electric front windows (the rears are the pop out variety), a leather steering wheel, five-spoke alloys and those blingy day running lights being the highlights. Okay, so perhaps something’s changed under the 107’s new bonnet? Hmmm, not really, still pretty much the same under there, too. 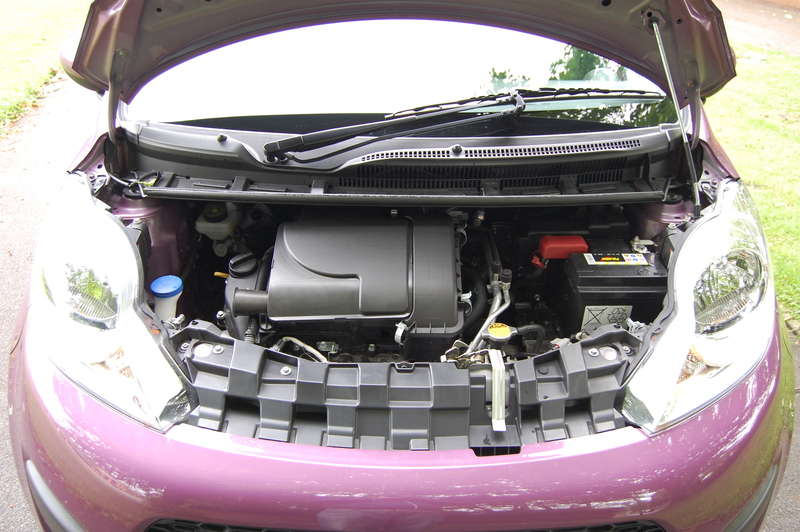 Nestled in the engine bay is Toyota’s 1-litre triple, which offers willing zip to get the 107 off to a decent start from a standstill, providing brisk progress up to 30mph. All this urban surge is accompanied by a satisfying rasp from the three pot, doing its best to sound sportier than the forward motion is telling your other senses. The Peugeot’s revised gearing may help it dip to just 99g/km of CO2 emissions but it also blunts performance in the higher gears, each one feeling like it’s taking an age to spin through its rev range. Eventually you’ll get into fifth and find the little Peugeot is a competent if noisy cruiser at the national speed limit; the engine note’s soured into gruff territory by then and it feels like a long 12.3 seconds getting there. Not that the Peugeot’s got a lot of oomph at its disposal but once up to speed it’s fairly easy and quite entertaining keeping it there. Back roads don’t frighten it off and whilst it’s not the wieldiest point to point car out there, it hangs on well through sweeping bends with greater tenacity than those skinny tyres suggest might be possible. Turn in through the short steering column is direct but lacks much in the way of feel, unlike the ride quality which, although it remains composed on billiard table flat asphalt, is unsettled when undulations provoke the short wheelbase into bouncing like a space hopper convention. Most 107s will tend to stick to built up environments and here they’re at their best, combining fine manoeuvrability, a decent urban ride quality and proving economical too, although the claimed 65.7mpg figure on the combined cycle seems a tad optimistic. Peugeot’s small cars were always held in high esteem for being well honed, fine handling city hatches as well as being practical and economical too. The 107 has only inherited a few of these positives. The 107 does most things asked of it competently, despite feeling its age, but seems to lack much in the way of fun, being more of an appliance than a cute, little car that you’d take out simply to enjoy driving pleasure. 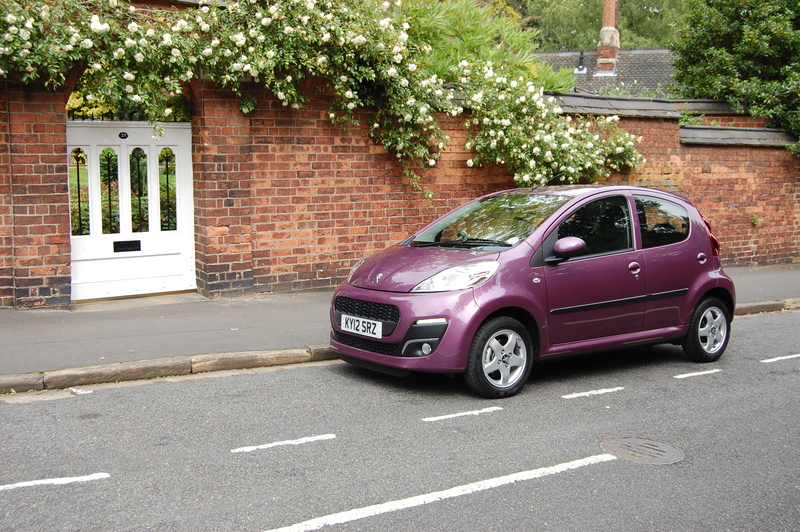 The Peugeot 107 has been around for seven years now, but keep the specification (and price) low and it still makes sense. That said, it’s still worth a look but as is ever the case with small cars like Peugeot’s 107, they make the most sense financially at the lower end of the scale. Air conditioning and Bluetooth connectivity might be sensible options but other than those the 107 is best kept simple and inexpensive. Thumbs Up: Still looks reasonably fresh, compact, ease of use around town, decent economy. Thumbs Down: Feeling its age compared to rivals, small boot, lacking in character compared to older small Peugeots. 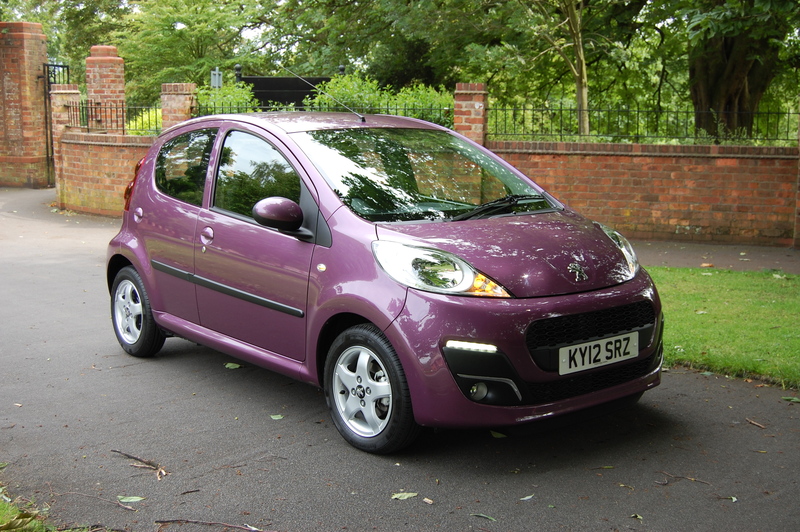 Peugeot 107 range starts at £7,995 for the Access 1.0 3-door up to £10,545 for the Allure 1.0 2-Tronic 5-door. Great review Keith. I can’t help but feel that the 107 looks a little lost amongst far greater competition i.e. Up!, Citigo etc. Visually, Peugeot seem to be clutching at straws and have simply opted to stick as many features and angles to the exterior as possible, or is that just me?